Animonda vom Feinsten Kitten cat food for kittens offers a good variety of carefully selected meats in different tasty variations. Does not contain any colourings or preservatives. 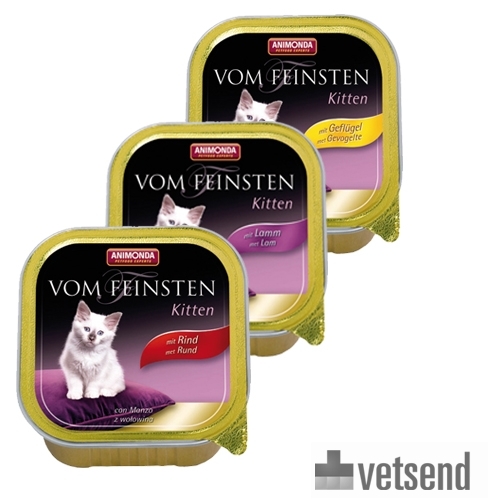 Animonda vom Feinsten Kitten is a cat food for kittens, which caters for the needs of young cats. This food offers a great variety of carefully selected meats in different tasty variations. It does not contain any colourings or preservatives and is available in beef, poultry and lamb flavours. With beef: 63% meat and animal derivatives (25% beef, pork, chicken), stock, minerals. With poultry: 63% meat and animal derivatives (20% poultry, pork, beef), stock, minerals. With lamb: 6% meat and animal derivatives (chicken, pork, beef, 8% lamb), stock, minerals. Have you used Animonda Vom Feinsten Kitten before? Let us know what you think about this product.